workouts, and get moving faster. Strained muscles from training, joint pain, even illness are all frustrating distractions that interrupt active routines. MSMPure™ can help restore vitality in connective tissue and enhance your recovery, so you can dial up your workouts, and get moving faster. nutritional support to give them their winning edge. MSM (Methylsulfonylmethane) empowers active people to continue their regimen by helping them manage the stress put on connective tissue and joints brought on by exercise. Poor diet, steroids, age, and chronic stress can negatively affect the immune system. MSM helps shield, protect and maintain healthy immune activity, even after physical stress. properties that help heal damaged connective tissue. 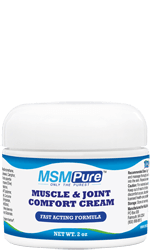 Science has shown, that the foundation of MSMPure™ products fifteen minutes after a workout reduces muscle/joint pain by 45%! MSM reduces pro-inflammatory markers while increasing anti-inflammatory markers to suppress inflammation caused by strenuous physical activity. MSM regulates mechanisms involved with healthy joints, muscle, and cartilage to help improve exercise performance to maintain an active lifestyle.